At this time of year our feathered friends are still looking for food to help them survive the winter. You can help supplement their diet by creating a simple feeder from materials you probably already have lying around the house. Plastic drinks bottles, clean yoghurt pots or milk cartons, wire or string, bird seed, and scissors. Cut a hole in the side of your container that is large enough to allow a free flow of seeds, but in such a way that it won’t fall out on the ground in the slightest puff of wind and won’t get wet if it rains. Make a few small holes in the bottom of your feeder to allow any rainwater to drain away. Hang it with wire or strong string from a tree or your washing line and fill with bird seed. If your feeder starts to wear out or the food in it goes mouldy, simply recycle it and make another one! 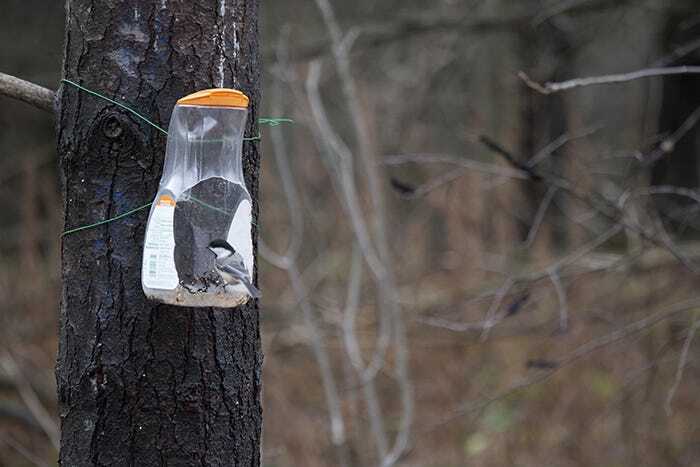 Remember to keep your feeders well stocked, especially in winter. Birds come to rely on them and will go hungry if you forget.